Grandma Cutting, a great cook, raised her family at Dakin Farm on thinly sliced cob smoked kielbasa stir fried with onions and green peppers and served on a bulky roll with a thick wedge of fresh tomato and melted cheddar cheese. 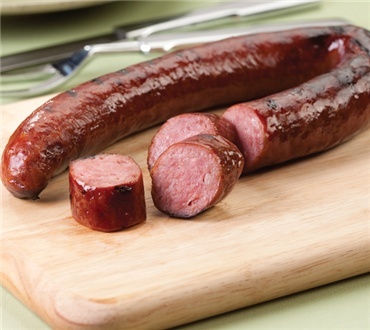 Over the years, the next generation experimented with cob smoked kielbasa cooked on the grill over an open flame and served with potatoes and sauerkraut in polish tradition. Another Polish tradition we have fun with is cooking kielbasa on skewers over a camp fire. No matter how you prepare it, youâ€™ll find our cob smoked variety more flavorful and irresistible than the ordinary. Two 12 oz. rings per order. I first tried this mixed with sautéed cabbage and mushrooms, fettuccini noodles, and a large dollop of sour cream for the most delicious Polish-inspired supper I have eaten since happy trips to my grandmother's house in Pennsylvania. It's great to combine with cheese and crackers and fabulous with pierogies. No store-bought brand I have ever tried come close to this rich flavor. And unlike store-bought brands, this one does not "repeat" or remain heavily in my stomach. I will be buying more for myself, family, and friends. Very good sausage, We have in the past just enjoyed it for dinner, but it would be good anytime ! Tasty and good quality. Only thing i would change is the casing - a little tough. And I say this being a person who loves snappy/crunchy casings.